Catherine wore the camel Reiss 'Shola' dress for her first official event as a member of the Royal Family. On 24th May 2011, the Duke and Duchess of Cambridge hosted the Obama's at Buckingham Palace. The event marked the couple’s first formal appearance since their wedding. A timeless, figure hugging dress featuring a box neckline, asymmetric overlays on the skirt and a band around the waist. Shola fastens with a concealed zip at the back. 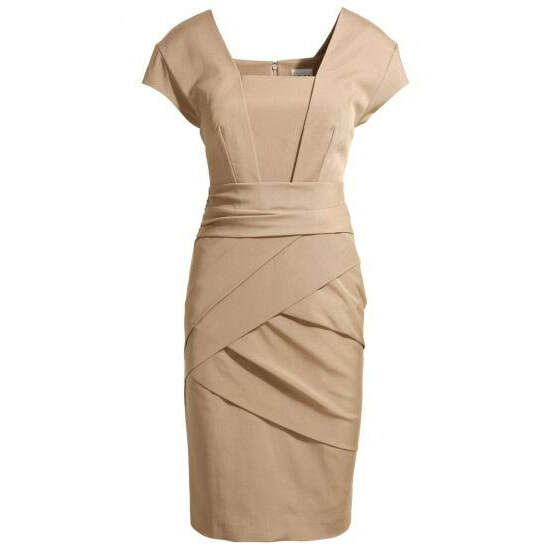 STYLE FILE: Reiss Shola camel bandage dress as seen on Kate Middleton, The Duchess of Cambridge.